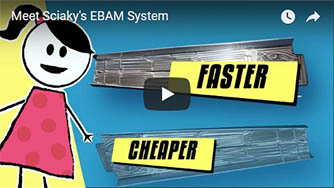 EBAM® is the most cost effective metal 3D printing process on the market. EBAM® is the fastest metal deposition process in the 3D printing market. Sciaky’s electron beam (EB) welding systems outperform & outlast the competition. No other EB welding job shop in the world can match Sciaky’s wide range of capabilities. Electron Beam Additive Manufacturing reduces the time and costs associated with traditional manufacturing (i.e. forgings and castings). And, compared to other metal additive manufacturing processes, EBAM® has a faster deposition rate (by up to a factor of ten) and provides unrivaled scalability for part size and part quality. In addition, EBAM® can be utilized anywhere in the product life cycle: from rapid prototypes and production parts to repair and remanufacturing applications. Plus, Sciaky’s patented Closed-Loop Control technology ensures that part production can be replicated according to the same established parameters (i.e. geometry, material properties, and material composition), from the first part to the last. Sciaky’s EB Welding technology provides exceptional weld quality with a high depth-to-width ratio and maximum penetration with minimal distortion. We have been at the forefront of EB Welding advancement for over six decades. Our state-of-the-art internal moving EB Welding gun is the most innovative gun on the market. Whether you have a traditional welding requirement that calls for joining common metals, or a more exotic application with refractory alloys, Sciaky’s EB Welding technology delivers remarkable results. Plus, our EB Welding technology is an excellent choice for joining dissimilar metals. Sciaky provides its world-class EB Welding Systems, Advanced Arc Welding Systems, and EB Welding Job Shop Services to a wide range of industries like aerospace, defense, automotive, energy, healthcare, semiconductor, oil & gas.